The story revolves around the members of a private military company (PMC), and the uneasy tension between them and the regular military after a war that caused massive environmental destruction. I thought that i was going to watch a good anime, not a masterpiece nor bad, but a good one, and this one was just average and i don't tend to give anime series a bad score, i always get the good things from the bad, but the story is filled with plot holes and things that don't make sense with parts left unexplained and cheap deaths that could've been avoided with logic. The story is a little confusing and only starts at episode 7 because from episode 1 to 6 is like giving the six characters a episode to know a little about their background (still they don't give much than, this characters does this because of that and they wanted you for some reason to get attached to them so you feel sad for what happens in the last episodes) and a part of doing an actual mission involving their past in the present, except for Saiki who's past still is a mistery and then it was predictable because they try to fool you to think that the ones you think are bad, are not bad, but that didn't worked, for me at least and then the cheap deaths, they thought that they were gonna have an impact on the audience but how could that be possible when you already knew that they were going to die and the last ep. was plain stupid and ilogical, that's a big plot hole and was not explained and i was waiting at least they explained that, but no, it was just stupid, the story was really bad developed even if you don't pay attention you will clearly see the big ilogical things, overall was mediocre and i don't want to give it a worse score because it wasn't a bad idea, but it was poorly presented. The art style was good, the 3D animation was good but nothing great in that department, sometimes the expressions were off, overall was good. The music was ok, the voice acting was dull with some characters, or they react late, like someone is dead, they make a close up to their faces and react late screaming when 8 secs passed, or almost every character felt emotionless, like if they were just following the lines to be done with that fast, well the OP was good and ED didn't fit, it was bad, overall was fine. The characters look good, what i mean is the idea they had for them (or at least i had for them) they looked cool but they weren't appealing more than just looking cool, Saiki felt more like a support character and Haruki felt more like a MC than a support character, Sakurako was the 2nd main c. but i felt she was more protagonist than anyone and those cheap deaths were unnecessary, overall was mediocre despite 5 of them being interesting excluding Haruki. I wasn't bored but i just wanted to watch the episodes fast, because of what i already stated before, they couldn't deliver a well thought story or better character development and make the voice actors do a better job, mediocre overall. Viper's Creed was made in 2009 by AIC Spirits (A company with some good stuff but a pretty questionable history overall.) It was was created by Aramaki Shinji. It aired briefly in America, but was quickly canceled due to low ratings. Honestly, given the stuff that gets popular in America, I'm not sure if that's a good or a bad sign. So let's take a look at Viper's Creed and find out. The story is pretty simple. Air and sea travel has been made impossible by a large-scale war. Cities have been isolated and contractors called Blademen have been hired by a foreign business to safeguard the city from bug mechs. 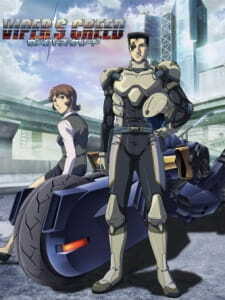 A terrorist group with really nonsensical ideas called Hound is also causing problems and the Viper team finds itself in the middle of a conspiracy. The story does some things well. The setup is pretty interesting and, when you find out the nature of the conspiracy, a lot of the seemingly nonsensical elements do end up making some sense. But the story still has a couple major issues. Instead of developing their characters naturally in the narrative they have several episodes that barely connect to the main story in which they inundate you with backstory. Because that's much better than learning about a character naturally. The story is also pretty minimal, when they do get to the main plot what you actually get is a lot of action sequences with short bursts of story. The ending is also a load of crap, but I can't go into details about why without spoilers. Let's move into the characters. To Viper's Creed's credit, they do try to develop the six major characters and it works, they are three-dimensional characters. The major problem is with the supporting cast, which is composed largely of one-dimensional characters and the antagonists who barely get any motivation. Another problem is that some of the major characters are just unsympathetic. The main example of this being Haruki who goes beyond naive and into the realm of being a complete moron. The worst part is that his complete idiocy is barely questioned. Let's talk about the art for a moment. The machines in this look really good. The action scenes are really intense and well done. That being said, they do some bizarre things with faces and the backgrounds are pretty lazy most of the time. The voice acting is good. Toyoguchi Megumi, Kuroda Takaya, Minagawa Junko and several others do well in their roles. The one real exception is Akiyama Nana who gives a rather uninspired and flat performance. I haven't heard her in anything else so I couldn't tell you whether this was the direction, inexperience or just a lack of ability at expressing emotions. I'm not even going to bother speculating on it. Then there's the music, a lot of it just doesn't work with the series. It's just too soft and serene for the action-packed content. The yuri factor is a 1/10. There's no yuri in this. My final rating for Viper's Creed is a 6/10. It does have some major issues, but it also has some great characters and great action scenes. If you can handle the story issues and the more minor issues then it is a decent watch. Despite the low viewer rating and the first review here for Viper's Creed, I absolutely loved this anime and I'm really hoping for a sequel. Story: 10--a good story, especially for so few episodes. Yes, the general storyline is a classic one, but it's a storyline that works, which is why it's been used so many times. Art: 8--at the beginning I remember thinking that the art could have used a few more frames to smooth out some of the movements, but overall it's animated in the usual style for the newer anime, and the action scenes are done really well. They knew how to create tension with the visuals as well as the storyline and sound effects by zooming in on something and omitting the focus. Really keeps you watching. Sound: 9--consistently throughout the series, I was amazed at the background music. It set the tone perfectly for each scene without making the view actually notice it until the director wanted the viewer to notice. Also, the ending song is my newest favorite (will be listening on repeat for another month). Sound effects were good overall, though most are the usual mech anime sounds (hydraulics, gunshots, metal, etc.). Enjoyment: 9--absolutely loved (almost) every minute of the anime. I usually go for happy anime (Shugo Chara anyone? ), and too much strife mid-series can permanently turn me off of a series. Great beginning, great end, it's the middle you have to watch out for. So, I docked one point, but still, it's a 9/10. Well..let's see...if not for the plot at least for the awesome art this anime deserves a shot. Overall: 8...i wanted to give a 7 but i am a sucker for great art and animation with action scenes so i gave it an 8 instead...it's worth a shot..try it out.